First of all, thank you SO MUCH for all of your support on Monday's post. The love and kindness within this community is so overwhelming. I love you guys! One thing that I have become absolutely obsessed with is monograms. I think it is because I am changing my name, and I just love to see my new initials! Monograms are a perfect way for brides to celebrate their new last name. They add a classy and traditional touch to whatever you add them to. And you can truly add them to just about anything these days! After all, if it’s not moving… monogram it. There is a whole world of etiquette when it comes to wedding monograms. Your monogram as a single lady will be different than your monogram after the ceremony, and the rules for a couple’s monogram are a whole new ball game! 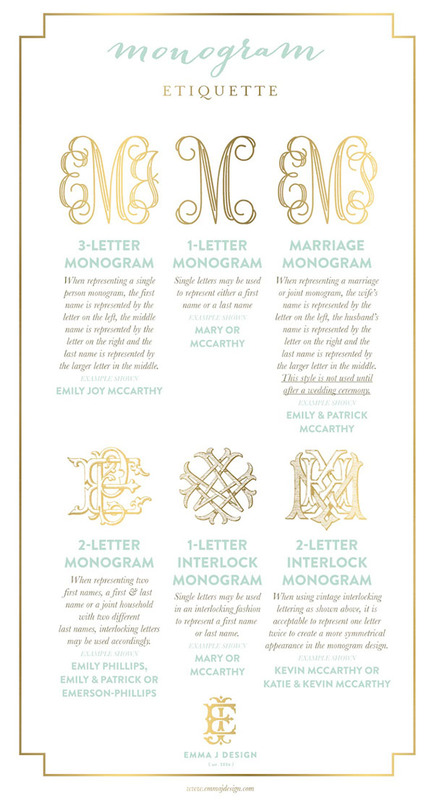 SouthernWeddings posted about monogram etiquette, and included this handy chart! I have for sure been using this when I am ordering things online (including our invitations!). Traditionally, before the wedding, the bride should use her maiden monogram for things that are her personal items. This could include things like clothes, purses or jewelry. But honestly, very little of our wedding is going to be very traditional. I don't see the problem with ordering things with your new monogram. I have broken this rule a bunch of times. When you use your monogram “officially” with your fiancé’s on things like a save-the-date, you should use an ampersand, and always list the bride’s initial first. For example, my fiancé and I are A&D. On our invites, there is a little space for a monogram to go. Instead of being super confusing, and having too many letters for a small space, I chose to just go with a Y. Simple, even though it kind of breaks the "rules." So while I think that it is fun to honor tradition with your monogram, it isn't mandatory. Have fun with it! Monogram away, friends!